"Egnater is setting the new standard for delivering boutique quality amplification in a standard production line�warm, powerful, and pristine tube tone, rock solid construction, remarkable versatility, intelligent and intuitive controls - everything a player could ask for, both in the studio and on stage." Eric Barnett is the lead guitarist in Bay Area band Points North. Points North creates melodic guitar-driven instrumental music, combining musicianship and a modern aesthetic with classic tones, song structures, and pop sensibility. Some of the diverse and noted artists Points North has played with across Northern and Southern California include Blues Traveler, Al Di Meola, Eric Johnson, Steve Morse, Larry Carlton, Michael Schenker (UFO, Scorpions, MSG), Steve Lukather (Toto, legendary studio musician), Pat Travers, Ronnie Montrose, Gary Hoey, Stu Hamm (who has performed with the band as well), George Lynch, and Uli Jon Roth (Scorpions, Electric Sun, Sky Academy). Eric began playing music at age 5 as a violinist, attending Manhattan School of Music and Juillard summer programs. 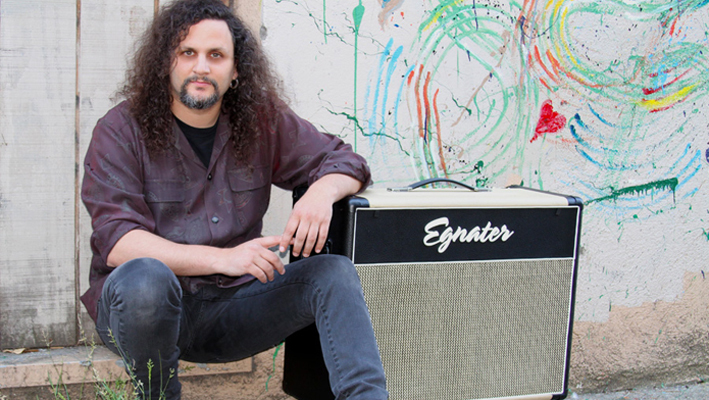 After switching to guitar, Eric attended GIT in Los Angeles, and played and taught in LA. Later on, Eric worked in New York as a studio musician, including with noted performer/producer Kenny Vance (Jay and the Americans, Steely Dan). Prior to joining Points North, Eric has shared the stage with national acts as diverse as The Offspring, Henry Rollins, Ween, Jeff Buckley, and The Lemonheads. Eric was also a finalist in Guitar Player Magazine's Guitar Superstar 2008 Competition, hosted by Andy Summers (Police), with judges including Joe Satriani, Steve Vai, Elliot Easton (the Cars), and George Lynch, and performed (with Points North) at the opening night of the Guitar Superstars Live! tour in San Francisco. Recent accomplishments also include instructional videos for GuitarTricks.com, composing and producing the lead track for Pinball Hall of Fame: The Williams Collection (a video game title for Crave Entertainment, PlayStation 2, PlayStation 3, PlayStation Portable, and Xbox 360), composing and performing television cues published via Atrium Music Group, and collaborating with esteemed composer Mark Griskey (best known for his work on the Star Wars videogame franchise) on movie trailer work.